Historically Waterwheels (aka watermills, water wheels) have been used to extract power from flowing water and convert it into mechanical power for turning grinding stones and other machinery. Although waterwheels have now died out of use across most of the world thanks to national grid electricity, they are still in common use off-grid in places such as Nepal and India where hundreds of thousands of waterwheels are still used to this day. 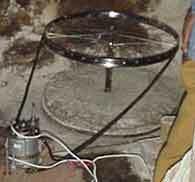 For many in the Himalayan regions a water wheel is the only source of power, together with dangerous kerosene lamps. Now people are looking at ways in which waterwheels can be used to generated electricity, not just for these remote regions, but also in Europe and North America where enormous energy resources are untapped at present. In developing countries where water wheel power is common, electricity can be generated for those people who live where the electricity grid cannot reach, and combined with modern energy efficient LED and CFT lighting, can improve their standard of living enormously. It is not complicated or expensive to modifyan existing waterwheel driven mill to operate as an electricity generator. Hydro-power idea for county river – A group are looking to restore and use 100 old waterwheels on the River Lugg in Hereford/Worcestershire. Hesco are currently developing a conversion kit for watermills to tap into the 2.5 Gigawatts of power in the 200,000 Himalyan watermills. Visit their website to find out the approaches they are using to modify waterwheels.